We are inclusive, welcoming, and community-centered. 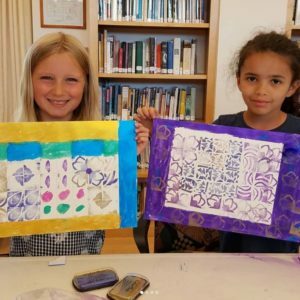 ASCC’s mission is nurturing creativity and community through the visual arts and our vision is “imagining art for everyone.” ASCC makes our programs accessible to persons of all ages, abilities and means. Our Art on Wheels outreach programs provide free, high-quality art programming to students from pre-Kindergarten to the vulnerable elderly in rural and small-town communities throughout Columbia County and beyond. Our classes for adults and older teens promote creativity with a commitment to excellence in teaching. We partner with libraries, schools, rehabilitation centers and nursing homes to bring art to where people live, including serving communities with high poverty rates. We provide crucial art enrichment to teens in free art programs taught in libraries and classrooms and in our free teen mentoring program. We provide employment opportunities for talented artists from our community, and create a rewarding environment with a commitment to excellence in teaching. Our programs are deeply interconnected and innovative: our conceptual ARTalks include outreach programs for teens, we host interactive exhibits, and our faculty teach both theoretical and hands-on classes. We offer scholarships funding up to 90% of class tuition, enabling new graduates, seniors on fixed incomes, and those facing hardships to experience creative renewal. Our Board of Directors and Executive Director are committed to a strong partnership and best-practices model of nonprofit management. ASCC’s community-centered adaptive reuse of an 1880 historic schoolhouse and landscape provides an inspiring setting of natural beauty for our students and visitors to enjoy. We are growing: we invite you to join in our future vision! Show your support: contact us to volunteer or make an online donation today.